Jax Anderson is the vibrantly energetic singer/songwriter from Detroit that performs under the moniker of Flint Eastwood. Described as “pop music that never sleeps”, her constant inspiration and tireless work ethic has made her a local staple of Detroit’s unique sound, touching many people along her journey. From heartfelt stories told by fans describing the impact of her music to the meaningful friendships she’s created and mentorship roles she’s taken upon among her peers, everything Jax does is filled with care and rooted in her passion of community. As a child Jax began to explore music through the various instruments that her father kept around the house. She started crafting melodies by the time she turned 14, forming a folk band with a friend while in high school. During this time Jax’s older brother Seth was exploring how to make Hip-Hop beats through original production software like Acid and Reason. “One day we were both home and he was working on something and I came in and started singing a melody on it and we just kept going with it and we’ve been writing together ever since.” Seth, who performs under the name SYBLYNG is responsible for the majority of the behind the scenes production of Flint Eastwood, while Jax focuses on vocal production and songwriting. While she has always created music, Jax first started her artistic career in film. For five years she balanced a career in film editing (primarily commercial work for major car companies and other freelance jobs) with music on the side. This tradeoff became soul sucking for Jax, realizing how badly she wanted to focus on her music. She began to dedicate all of her time to music, freelancing video projects whenever she desperately needed the cash. "To encourage people to be authentically themselves, by authentically being ourselves, and to spread hope to people. That is the vision..."
Jax’s expertise in video production has since influenced a wide variety of her work, directing the majority of her music videos and edited several of them. Jax is a natural storyteller, and her music videos provide fitting visuals to the dark and twisted tales portrayed in her music. She often envisions a story as she engulfs herself in her songwriting, and she tends to keep others in mind while doing so. Having grown up gay in a religious environment, Jax is no stranger to the struggle of trying to be yourself. 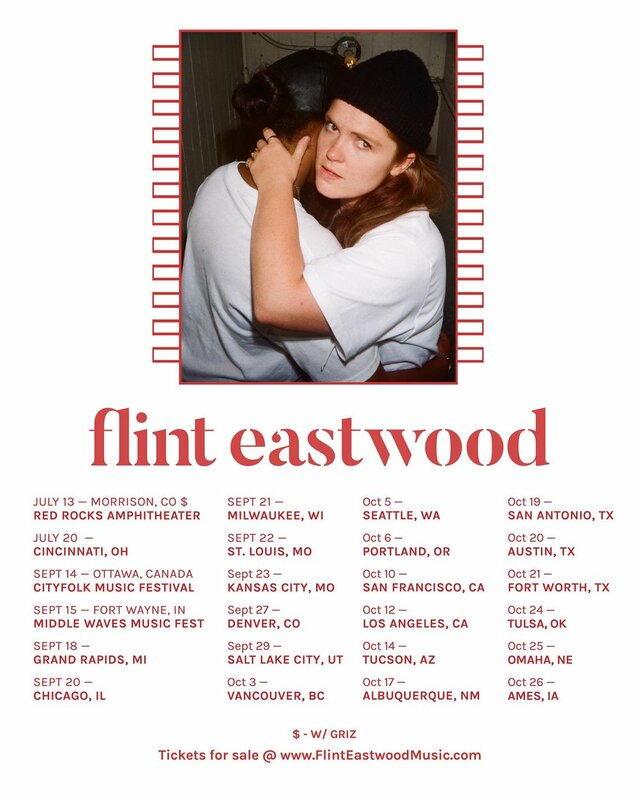 Flint Eastwood’s demos span folk and motown to pop and electronic to hip hop. Reflecting on her recording process, she describes the terrifyingly vulnerable experience of telling a room full of people all of your secrets. But Jax isn’t the type to dwindle in conflict, rather she addresses it head on. Seeing the value in everyone’s unique energy, Jax keeps an open door policy for all of her studio sessions and strives to try anyone’s idea that they present. Her humility and lack of self drives her to welcome critiques at all times, while her fear of getting stagnant pushes her to grow and evolve as an artist and community member. "...when you’re writing a track you’re writing it to release it to the world. It’s not yours, it’s the world’s..."
This sense of community shines through everything that Jax does. But much like the stories told in her music, she hasn’t always been able to relish in the beauty of a community. After dropping out of her first year in college Jax moved to LA with her brother and spent a lot of time collaborating with different artists and developing her video skills. She moved back to Detroit after a year and yearned for the the collaborative opportunities that LA had provided her. She began to make plans to move to Nashville with her brother Seth in search of this community environment. It was around this time that the siblings attended an event thrown by local Entrepreneur and Chicago-Native, Garret Koehler. They were blown away by his ability to bring the community together and instill the same type of excitement that creatives often seek from major cities like LA and New York. After this first event they realized that what they truly wanted was to build this same experience in Detroit, encouraging people to collaborate. They wanted to create a lasting impression on the Detroit music scene and to establish an environment where if one artist pops off, they all come up together. All they needed was a space where people could work together. So they [Garret, Jax, and Seth, among others] purchased an old church from 1872 and created Assemble Sound. Located next to the famous Michigan Central Station, Assemble Sound has served as a focal point for the musical and creative community in Detroit and it his home to several exciting new artists coming out of the city, including our friend Sam Austins. These artists, of course, have been touched by the wisdom, compassion, and generosity of Flint Eastwood. They’ve instilled a collective momentum of strong art, and Jax’s only requirement in collaborating is that you work hard. For Jax, success is when all of her friends are thriving with her. At the moment, Flint Eastwood finds herself going through a lot of changes (she even ditched her iconic flat-brim hat). Her new music is very reflective. She’s writing a lot about sadness and loneliness, but she’s also writing about romantic love for the first time. She plans to release a conceptual mixtape this fall with roughly six songs stitched together into one solid piece. The production will be a bit more subtle, with a diverse roster of producers. Jax has been writing so much that she’s eager to start releasing music more frequently, and she is intrigued by the modern immediacy of music. She’s shifting her obsessive focus on her musicianship to a wholistic approach towards the overall experience of her music, including the her live performances. While a shuffle through her catalogue may take you through a blend of happy and sad tunes, one thing that you can always count on is the energy of her performances. She has a very intense live show, and the ensemble of a live band brings a whole new energy to the unique soundscapes crafted by her brother SYBLYNG. You can count on Flint Eastwood giving it her all during her live performances, and her only hope back is that you show your true colors. Thankfully, Jax will be back on the road soon, with plenty of new music and visuals to share. Check out her tour announcement and see her soon!